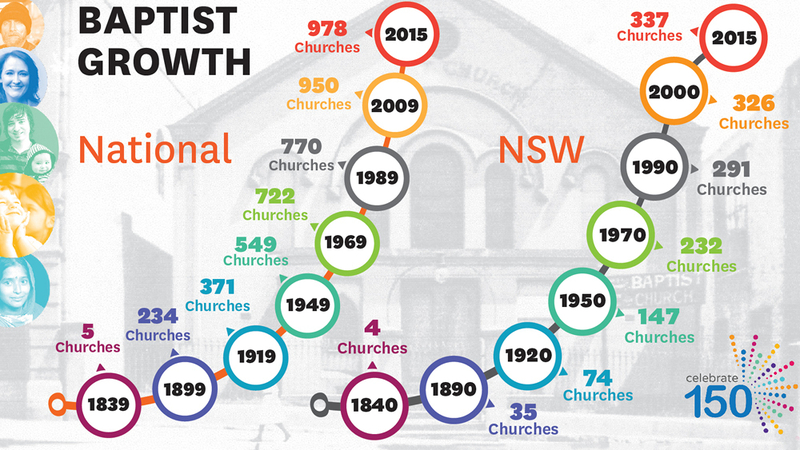 This year the Baptist Association of Churches in NSW and ACT celebrates its 150th anniversary. The Baptist Association is a voluntary network of churches that hold a common theological belief framework, purpose, values and vision. These 350 churches work together to further the gospel of Jesus in word, sign and deed. It is this commonality and a passion to see the kingdom of God expand that brought Baptist churches together 150 years ago. They knew that in order to serve Christ, to make him known and to live out the Great Commission in NSW, they had to work together. And for 150 years they have done exactly that. In the early days of the association, prayer was a central focus. The small group of churches fell to their knees and cried out to God to empower them to follow his calling boldly. This prayer bore fruit and the number of churches grew. Church planting was key to the growth in numbers, a vision that continues through to today. The association is currently prayerfully pursuing a goal to become a movement of 1000 healthy Baptist churches in the next generation – primarily through revitalisation, evangelism and church planting. In the early days of the movement, it continued to flourish as it focused on three key areas of development – transforming discipleship, incarnational missional activity and impacting social engagement. Empowered by the Holy Spirit, these three elements drove significant growth. With this philosophy of ministry permeating the culture of the Baptist movement, significant social justice, mission and aid ministry was birthed from the local church. Baptist World Aid Australia began out of Frenchs Forest Baptist Church, on Sydney’s north shore, growing into one of Australia’s largest and most dynamic faith-based international aid agencies and significantly impacting communities across the world through advocacy, aid, development and education. BaptistCare, a ministry originally called the NSW Baptist Homes Trust, was established to provide housing for the aged. Through this and various other ministries including HopeStreet it offers support, care and compassion to street workers, the homeless and survivors of domestic violence as well as numerous partnerships with local churches to provide services to those in the community with significant needs. NSW and ACT Baptists have invested heavily in global mission, especially through the national Baptist mission agency Global Interaction. One of the key areas of cross-cultural mission focus was the highlands of Papua New Guinea, where people were unreached until the middle of the 20th century. In the decades following World War II the gospel was carried into the region and God worked powerfully, to the extent that now this region has an extensive Christian community. The growth of the number of churches in the association led to a need for equipped leaders to pastor churches and disciple new believers. Morling Theological and Bible College began with a goal to raise up, equip and release ministry leaders into churches. The college recently celebrated its 100th year of serving the Baptist movement (and other denominations). It continues to grow and respond to the changing needs of ministry in the 21st century. On May 17-18, Le Montage at Lilyfield in Sydney’s inner west will be the venue for a unique gathering to celebrate what God has done in the life of NSW and ACT Baptists over the past 150 years, and to be inspired and equipped towards God’s amazing collective vision that he continues to call the association into.